Google is rolling out a feature update for its Gmail app for Android, which adds a security feature to prevent phishing attacks. 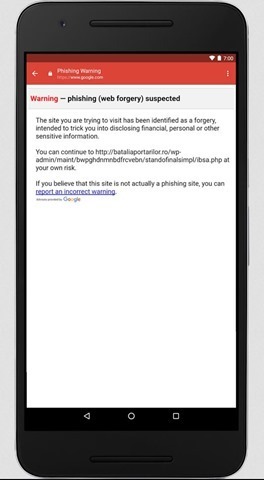 When a phishing email arrives, and you click on the link in it, Gmail will warn you with a screen, which looks similar to the one featured here. This is a good way to prevent scammers from tricking you, or attackers from gaining access to your email. The new feature will be rolled out over the next few days for all users. We think this is likely to be a server side update, rather than an app update. Interestingly enough, this announcement comes on the same day, when the official Gmail Twitter account posted a message warning users about a new phishing email. The attack in question comes in the form of a fake mail which appears as Google Docs, and warns users not to click on the mail. Instead report it as phishing within Gmail (from your desktop browser). If you doubt that your contact could be hacked, always check for suspicious signs. Look for the sender’s email address, writing style (if the mail is from a familiar contact), subject, the time and date when the mail was sent. Gmail for Android gets security feature to prevent phishing attacks and here is how it looks. Android Fake ID vulnerability affects all Androids from 2010 onwards.